There’s something so appealing about popping a poem into a pocket. Aside from the alliteration, and that surely makes an impact, I think it’s the lure of the surprise, the fact that something as powerful as a poem can be hidden away in a pocket, ready to be produced to applause! Special weeks like Literacy and Numeracy Week, or Children’s Book Week, and special days too, are a great way to make sure you have a special focus on celebrating something as hugely important as literature and literacy. Yes, of course we spend time with our kids engaged with literacy and literature each day, but I believe there’s a definite place for special days and weeks. It gives us a chance to show solidarity with other readers and literature-lovers, and raises the profile of reading in our communities. 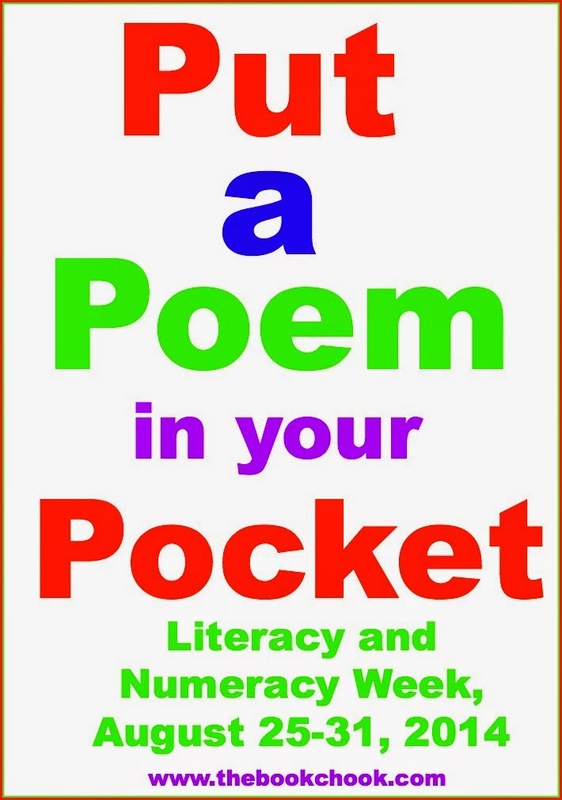 When is National Literacy and Numeracy Week in Australia? August 25 - 31, 2014, plenty of time to prepare to pocket a poem! Young children can learn a lot not only by listening to poetry read aloud, but by the process of actually writing a shortish one out by hand. Have kids think about pockets. Does a pocket need to be attached to clothing? Could they perhaps create a special, standalone, pocket for holding a special poem? What could the design be? How will they make it? What fun to browse books of poems, revisit loved poems, ask relatives for favourites, and choose one special poem for The Day! Although it’s lovely to write out and decorate a special poem on a sheet of paper, why not go high-tech and have children record themselves reading a poem? Using audio software. that can be copied onto a thumb drive, just the right size for a pocket too! *Set up a poetry walk at the school—so students can read their poems at certain points along the walk to other students. Poems could also be displayed along the walk or written in chalk on the path. *Hold a poet’s picnic event, which the whole school and parents are invited to. If this is held over lunch you could enjoy some food and get everyone to share a poem they’ve written. *Select ‘reporters’ to interview students about their poem, what form of poetry they used and what their poem means to them. *Hold a poetry recital—get students to read their poems during reading time. *Offer a poetry prize—you could ask students to submit their poems and either the teachers or the student representative council could evaluate and judge the poems and pick a winner. *Plant poems in your school garden so students, teachers and parents can read them as they walk past. and one I’ve written for the Australian Children’s Poetry website, called Using Technology for Poetry Creation and Presentation.